What is a better gift than flowers? Nuts, Dried Fruit, and Chocolate! Finding the perfect gift for someone is hard. Do you get something you would like? Do you get something that they would like? Do you only get something that you know the recipient would never get for themselves? Do you get something practical or something extravagant? 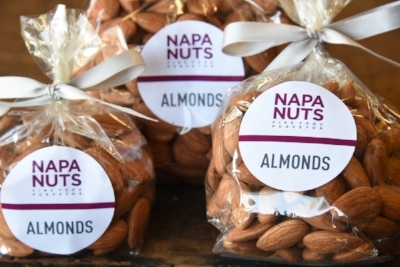 We here at Napa Nuts, while being totally biased, would recommend a gift of nuts, dried fruit, and chocolate and to fulfill gifts for every occasion. These luxury items are universally loved by everyone, easily shareable and super practical. Your wedding guests will love a sweet treat or a savory snack to eat on the way home from your amazing reception. 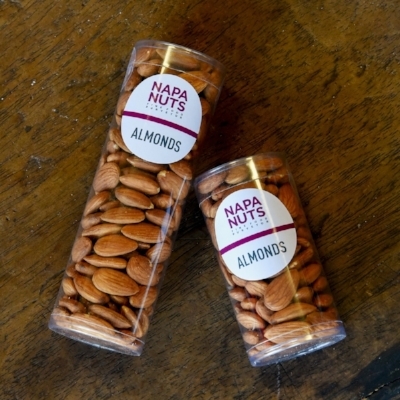 Napa Nuts offers a huge variety of products in custom packaging for your wedding gifts. You can offer your guests something delicious with custom labels and colored ribbons to match your wedding them. We have worked with many wedding planners, brides, and grooms to put together the perfect custom treats for your guests. We can even put together full welcome hotel bags so your wedding guests have a few wine country snacks in their room. Our recommendation: Eco Cello bags with custom labels. Let’s face it, we have all grabbed favors from these big parties and put them away for a few months before they eventually got thrown away. While it seems like a great memory, what kind of host wants to give people something that will eventually be thrown away. Chocolate treats, salty nuts or juicy dried fruit are a great solution. We also offer custom labeling so you can mark the event with names of the honorees. We see many people take them home, but just as many who eat them in the car. When the holidays roll around and you feel obliged to get a gift for someone, a delicious tin filled with gourmet chocolate covered dried fruit, roasted & salted mixed nuts, and California-grown almonds is the perfect choice. You can customize your tin so that it gets filled with items you would want to snack on also. Custom gift tins are a great "thank you" gift as well. Napa Nuts can ship your gifts all over the country without having to pay astronomical mark-ups for a lot of packaging and limited amounts of food. Napa Nuts gift tins are filled to the brim with gourmet products. Our recommendation: 3 item gift tin with one nut choice, one dried fruit choice, and one chocolate choice. What are your ideas for how to gift nuts or dried fruit? Leave us some comments with your thoughts. There seems to be a new study every week that tells you that Omega-3 fatty acids are healthy for you and that people should be eating more of it. There are a huge array of supplemental pills that people can add to their diets. Supplements are largely unregulated and the research shows that eating foods rich in Omega-3s is much better for you than a pill. Seafood is a great source of Omega-3s and often gets the most attention. Many people are unaware that nuts and seeds are also wonderful sources of these same Omega-3s. We would also contend that nuts and seeds are also much more versatile ingredients for your daily diet. For those that disagree, may we recommend the Saturday Night Live classic, The Bass-o-matic? Nuts and seeds have a great shelf life, don’t smell when uncooked, can blend in with what you are already eating, and be used to enhance the flavor of your dishes. In order to make eating more Omega-3s as easy as possible, here is our list of items that you are already eating at home (with a slight California bias) that could get a quick and easy Omega-3 boost. Avocado Toast is the new craze at the hip breakfast places, but it is really easy to make at home. This is generally a very healthy and filling option for breakfast or snacks. Avocado toast also tastes great with a drizzle of hemp seeds or flax seeds on top. This will add those Omega-3s and bit of happy texture to your breakfast. 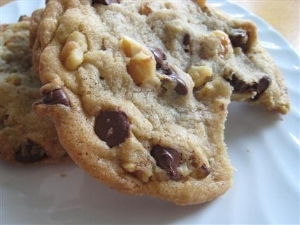 Walnuts are a necessary part of many people’s favorite chocolate-chip cookie recipe. We embrace this idea. 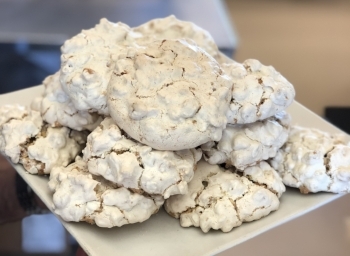 A quick tip, for those not already on “Team Walnut”, if you get fresh, light walnuts (instead of dark, and the only kind we sell), a lot of that bitter flavor goes away. If you want an even bigger boost of those healthy Omega-3s, you can also add a few hemp seeds, or flax seeds into the batter. This will add a bonus bit of fiber and not have a huge effect on the taste. Pancakes are super simple to make, and are a great canvas to create fun breakfasts. Next time pancakes get made in your kitchen, throw a few flax seeds, hemp seeds, and walnuts in there. It almost doesn’t get any easier than this to make your easy breakfast a bit healthier with some Omega-3s. Almost everyone has a blender. Fruit smoothies are delicious, and a healthy way to beat the summer heat. While mixing, throw a few chia seeds in to thicken a smoothie that has a bit too much juice. Adding a few flax seeds will also add those Omega-3s, and the seeds are small enough to fit through the straw. Oatmeal is more of a winter breakfast in many houses. Just like pancakes, it is also an easy base to use to create a more exciting breakfast. Walnuts are great to add a bit texture. Hemp, chia, and flax seeds are all also all great in an oatmeal. Here at Napa Nuts, we also like our oatmeal with a bit of sweetness. And just to stick with the Omega-3s, blueberries and mango are both naturally sweet and high in Omega-3s compared to other fruits. Once those omega-3s are in your breakfast, you may feel like you want to stay healthy all day. You may also be ready to indulge in some guilty pleasures later in the day, without feeling too guilty. Carrot cake is a really smart choice for Omega-3s. Walnuts are a standard ingredient, and it is really easy to get people to eat carrot cake. To add another boost of Omega-3s, try using a chia egg or flax egg instead of chicken eggs. Surprisingly enough, seeds can be used as a vegan egg replacement. This is not something that will have a dramatic effect on the flavor of your cake, but will make it a bit more nutritious. With both seeds and nuts in your cake, each slice could be a full serving of recommended Omega-3s. But most people will eat it because it tastes good.